In order to preserve their growing collection of barrels for ongoing use, the brewers at Hawkers like to refill them as soon as they've been emptied, pumping them full of CO2 as they're drained with the next base beer ready to be siphoned in. 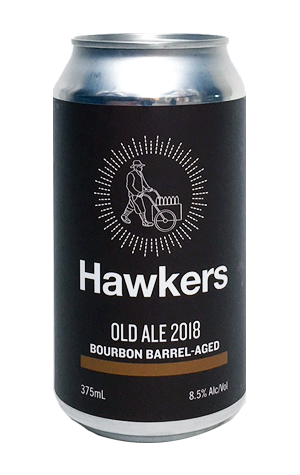 When it came to the bourbon barrels that housed what was to become this beer, they hadn't actually planned what was going to become their new resident so decided to knock up an old ale, a strong, malt-rich beer with origins in England that's not too far away from a Belgian dubbel in terms of flavour, aroma and booze content. The beer that, ten months later, has been extracted as part of the brewery's ten barrel aged beers in a few weeks for winter 2018 has gained added booziness during its oaky slumber, as well as a marzipan like streak that masks some of the sticky, treacly dark fruits you might expect from a straight, un-barrelled old ale. More comes into play on the palate: toffee, burnt sugar, vanilla, unvarnished bourbon and a touch of heat. The tasting notes on the can refer to this being a beer inspired by those before the Industrial Revolution; it seems apposite as there's a rough and ready character here suited to quaffing from flagons in some hay-strewn inn.